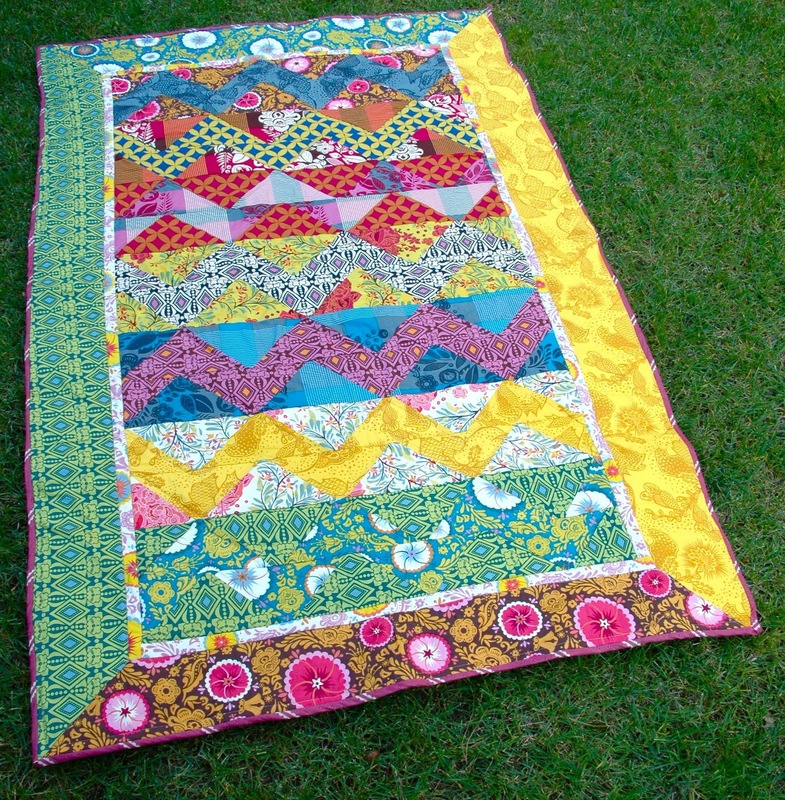 This is my very first quilt. Sort of. I started it, and then the I Spy frenzy overtook it, and it was pushed aside for a bit. My mother had planned a visit in April and I was so so so excited to give this to her in person. My very first quilt, just for her. Except she never made it. The ridiculous volcano craziness killed her trip. By the time the upheaval was sorted out it was time for me to come back to the states anyway. I am, of course, glad that the volcano was mostly an economic crisis and not a crisis for humanity. That said, I was pretty upset for a while. She was supposed to be able to be there for M’s first birthday. And M was crawling but not yet walking and so deliciously cute. And I was going to give her the quilt as an early Mother’s Day present. And we had all sorts of fun stuff planned for her trip. Waaaaaaah. I still want to cry about it. So now that I’m in America again, and she’s finally freed from a few things she has had going on in her world, she has just arrived to hang out with me and the girls for the week. I can FINALLY give this to her. I was inspired to make my first (second? first? first. Let’s call it first. I’ve confused myself) quilt by my Mom and by AMH. I/we lovelovelovelove Good Folks as previously discussed on our blog and Adrianna and I are both in a period of mourning over the discontinuation of the line. 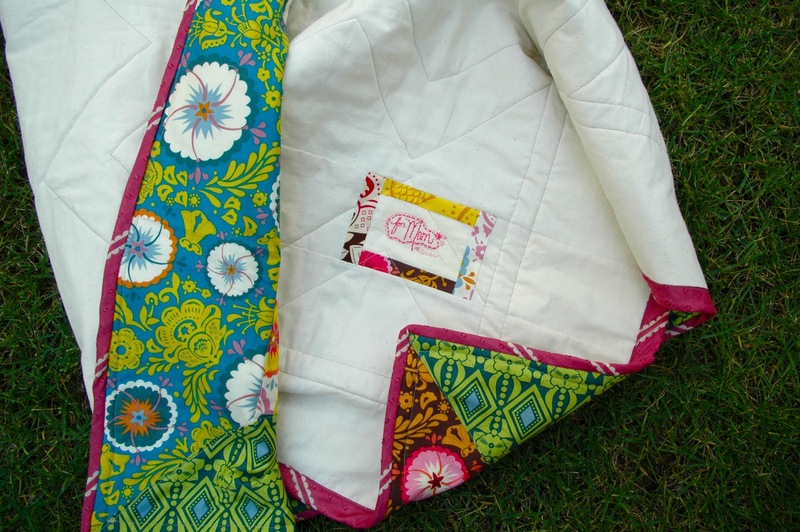 This quilt was totally influenced, of course, by AMH’s folk dance quilt. Had this not been my first/second quilt, it might look more like hers. But I went a little nuts in the process, and… well… it evolved. Whether I originally meant for it to or not. 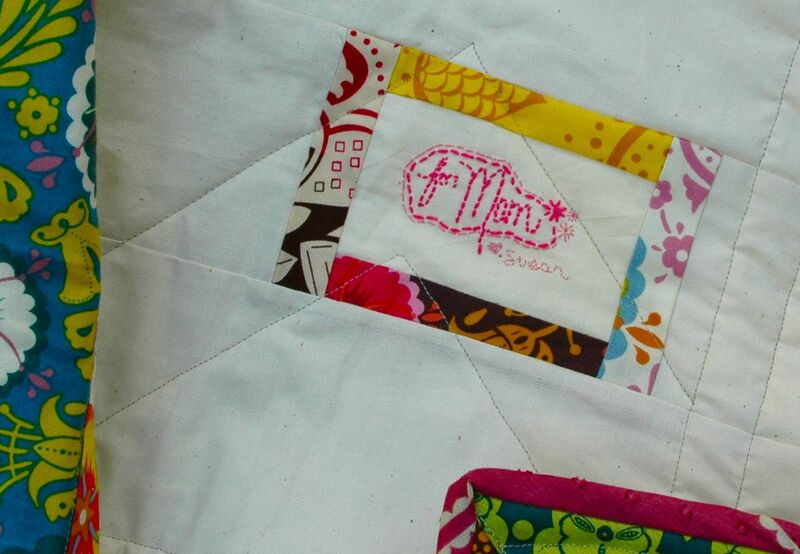 This quilt bears more of the markings of a learning curve in progress. 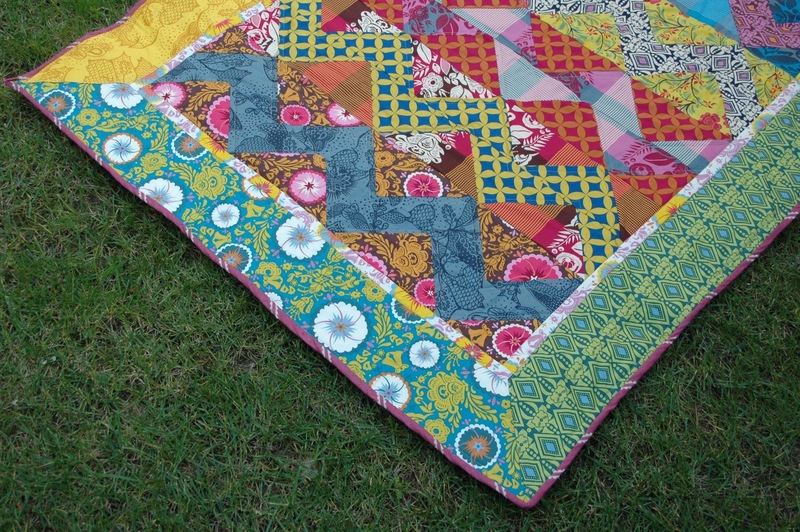 Just like the I Spy quilt, the zig zag quilting made a pattern on the back that made me a happy. Whether I had originally meant for it to or not. And I had to add a little embroidered bit. ‘Cause it was for mom. And she’s been pretty patient with me and all of the running to and fro with her grandchildren. So glad to finally have this in her hands. She slept with it the night I gave it to her. I’d call that a success. I’m dying to start another quilt, but I still have a few weeks of relocation upheaval left. In the meantime, we’ll make up for lost time with my Mom. Fortunately, M is still deliciously cute. Love that Good Folks. I don’t think there is a thing you could sew with it that would go wrong. 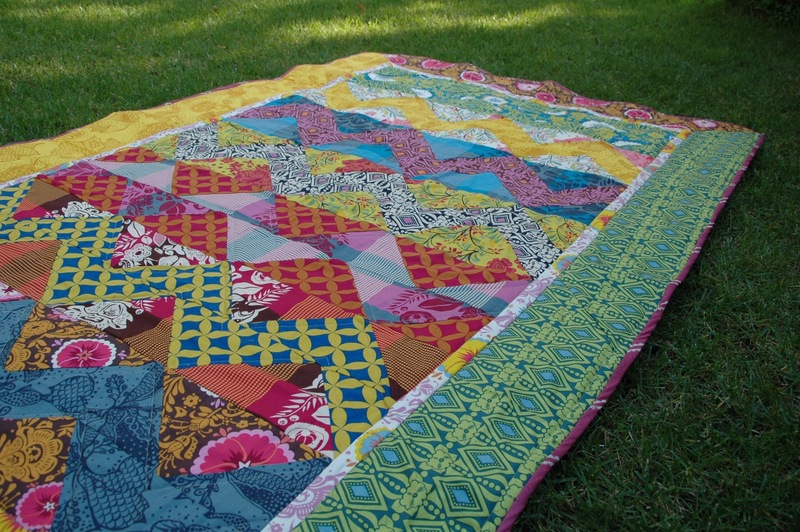 Way to go on finishing your “first, first” quilt. That’s a beautiful quilt! Great job! This is beautiful! 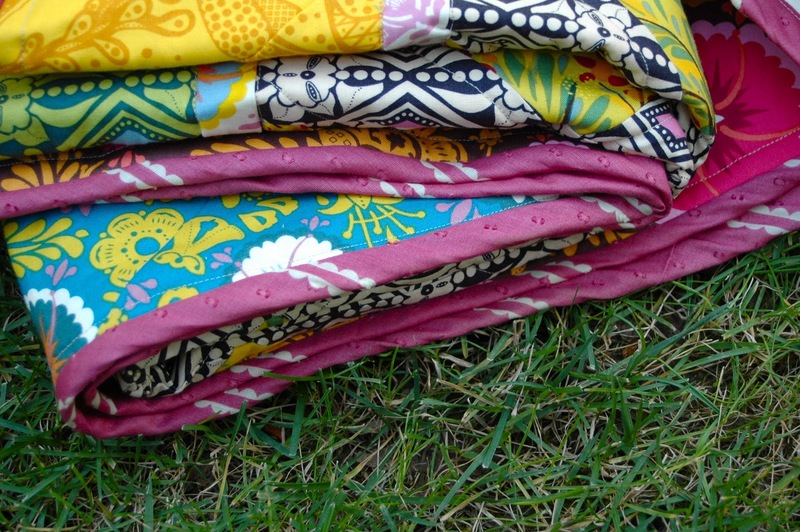 I love the colors and patterns! Great job! 3) googling and youtubing the steps as I went along. Love it! Glad you and your Mum are able to get together. Did I really not comment on this before? ?